The Juneau Avenue frontage offers a particularly dynamic view of the arena as the extension of the arced long-span roof seamlessly transitions to vertical wall between Fourth and Sixth Streets. 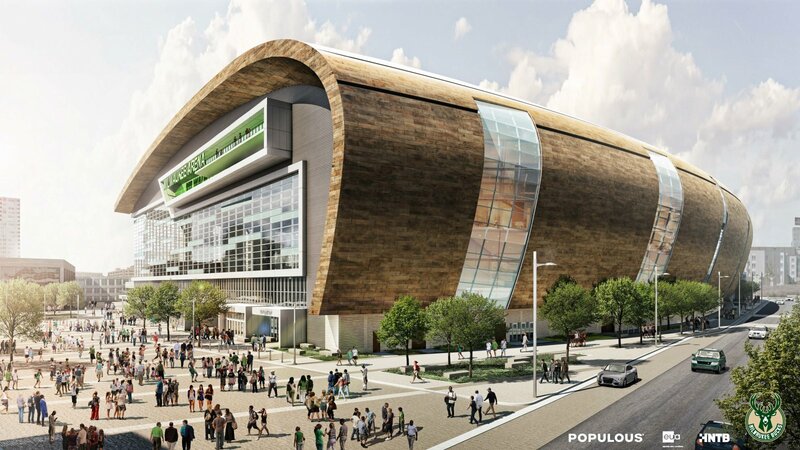 Curved in both floor plan and vertical section, and clad with warm pre-patina zinc shingles, the arena expresses an iconic presence from both vehicular approach and more intimate pedestrian vantage points. Six vertical glass “ripples” punctuate the zinc facade, revealing activity at multiple levels within. A gradation of ceramic frit pattern on the glass accentuates vertical curvature of the ripples and a varied visual character at night.